I try. Sitting out on my deck today I see that bird feeding is secondary to rodent feeding. Bird Station #1. Our oldest feeder, holds a ton of bird seed. I think I bought it as a gift to my husband who liked to feed birds. Supposed to be squirrel proof. Supposedly hard for heavy birds (grackles and starlings to use) as the lid closes if the weight is too heavy. 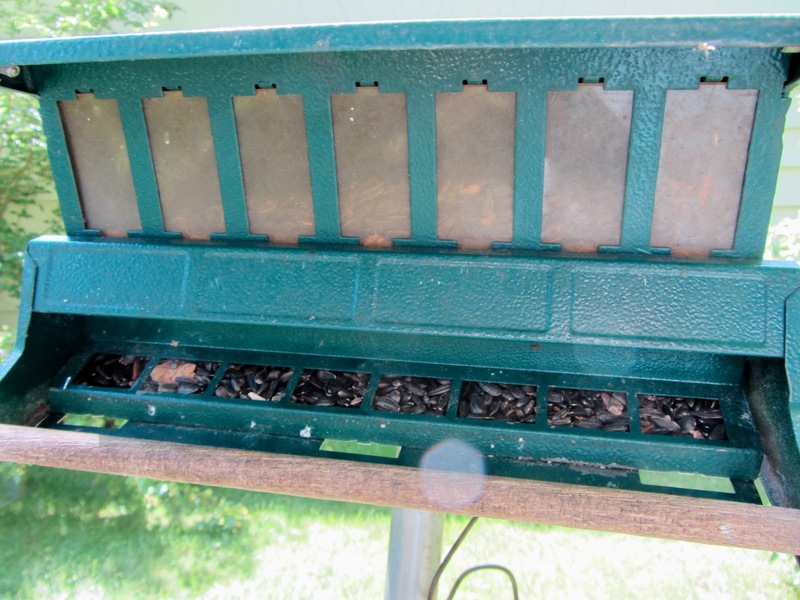 My rating on this feeder, good feeder design if you're a heavy squirrel, starling, or grackle. 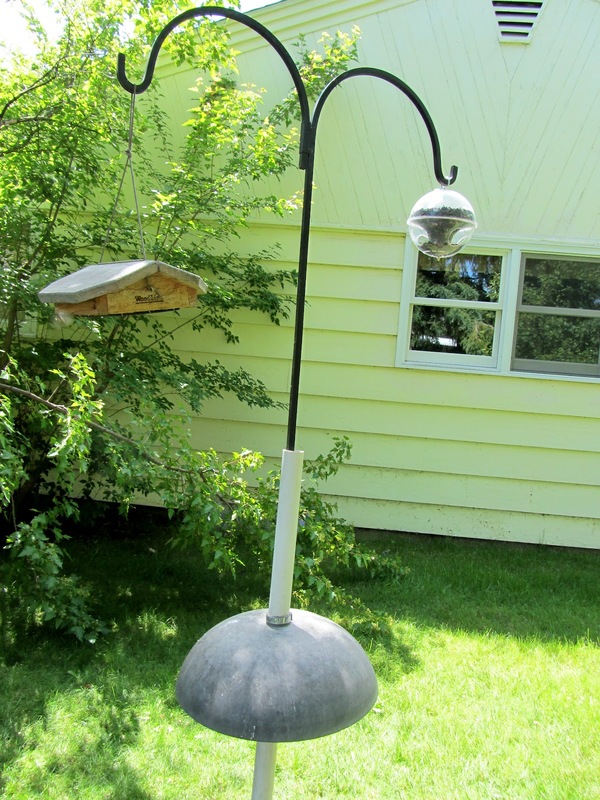 But, if you are a finch or small songbird, you really don't like this style feeder that much. Used very infrequently by small birds. Bird Station #2. A shepherds's hook with a squirrel baffle. Our newest feeder. 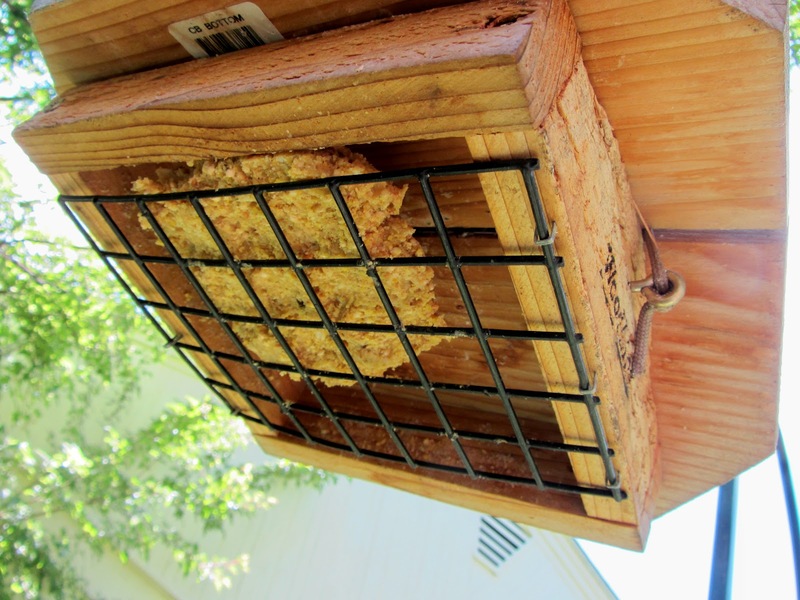 A Duncraft cling a wing small bird feeder with small holes for small birds to enter and keep big birds out. Not very popular yet. A small amount of moisture accumulating on the top of the plastic globe. Not sure why? 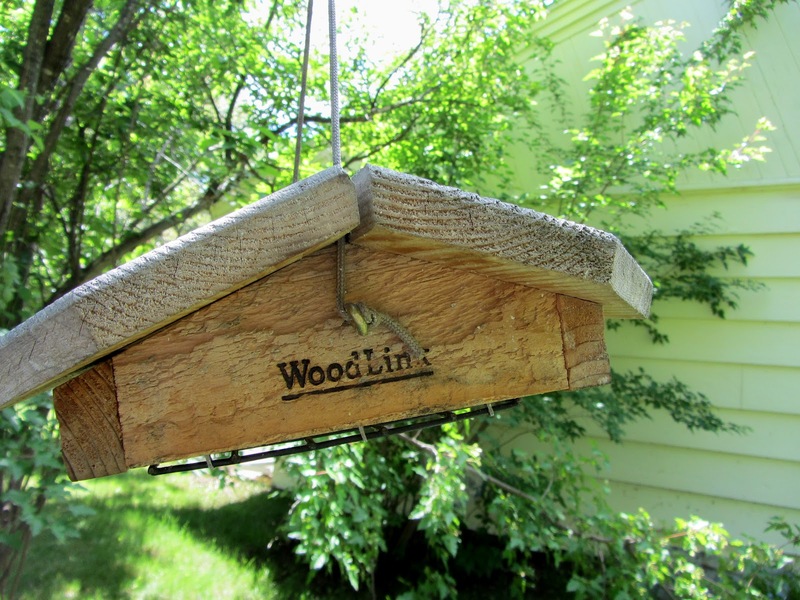 Suet feeder by Woodlink. Supposedly big birds can't hang to get suet, so woodpeckers and chickadees and nuthatches can use this. I have seen woodpecker and nuthatches in previous years, but so far a grackle/starling and squirrel feeder. Wish it worked as I have two of these after my Mom moved into an apartment. Bird Station 3, the thistle feeder. Really nothing but finches frequent it. But not this year, few finches. Only filled thistle feeder 4 times this spring. 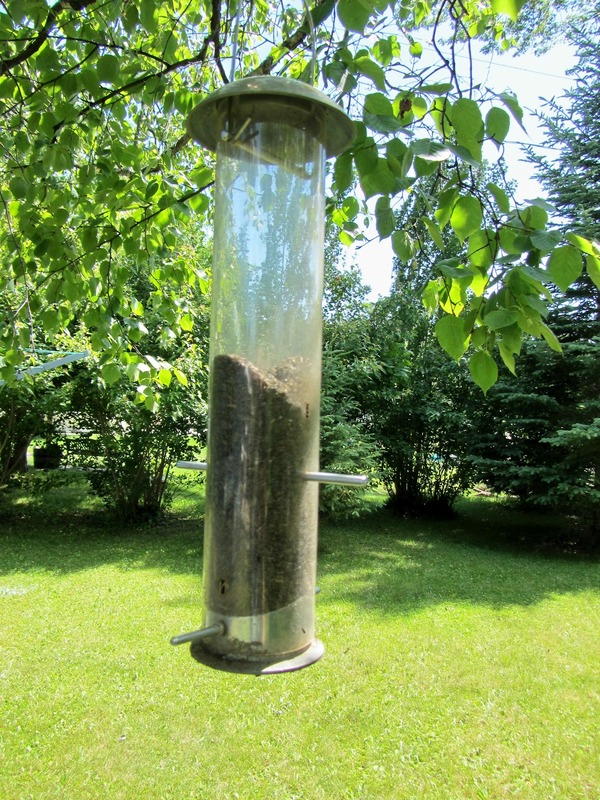 Bird station #4, the popular feeder. The squirrels can empty this one in about an hour. No birds, except the occasional mourning dove seeking spilled seed. Chipmunks too or should I say three are here feeding on the spoils. Bird watching, used to be fun. Not so much anymore! Any suggestions? Wonder what has them scared away.......or who is feeding them instead. You sure are trying. Maybe they will still come.........the sqirrels are happy in the meantime. Maybe they are feasting on the army worms. I wish!!! I quit feeding the birds, because I was attracting too many pigeons (and squirrels, too). Let's just say pigeons are my second least favorite bird. Sap suckers moved up to the number 1 spot this year. 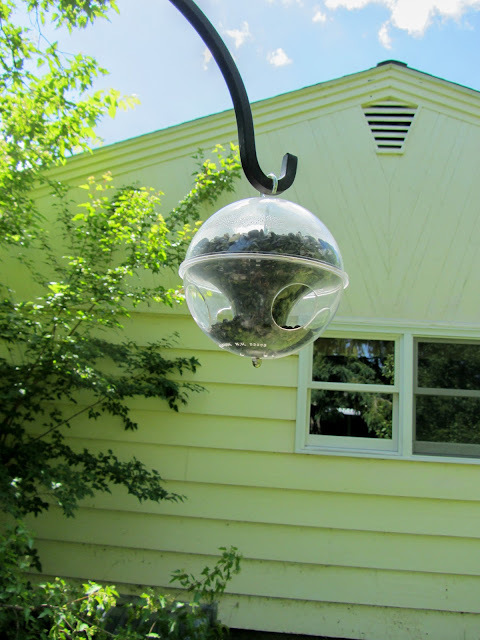 I don't even hang hummingbird feeders anymore because all I attract are swarms of wasps! Carlene, we used to have a bird feeder at work and we did more squirrel watching as they attempted to get the food. Saw some pretty funny stuff as the squirrels tried to outsmart the feeder made to keep them out. We quit feeding the birds and now they naturally frequent the garden area outside our window. We have some hawks around now too. They are fun to watch. The smaller birds chase and harass them and we also see them get rodents and fight over their catches. Then we have mockingbirds making nests and they take a swipe at us if we are anywhere nearby. Always interesting for sure! 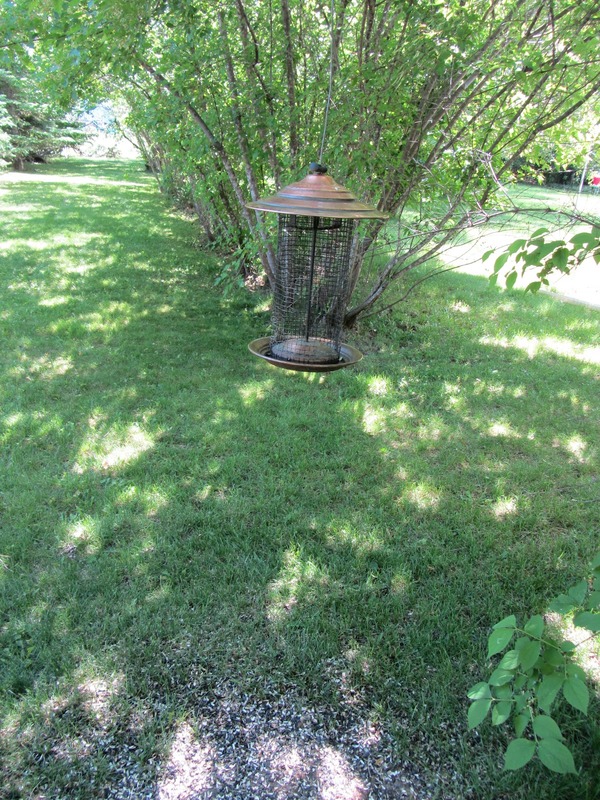 I have a Yankee squirrel-proof feeder. It tips if a squirrel gets on the tray and is too long for a squirrel to sit on top and reach down. However, when I hung it on a shepherd's hook, squirrels would hang on to the pole with their back feet and rest their front feet on the tray and feast away. Once I found a spot where they couldn't stretch to reach it, all was good. I get cardinals, chickadees, purple finches, tufted titmice, to name a few. I love to feed the birds...but it has become an expensive hobby. Seriously, I could buy a huge bag of seed every 3 days....and I think mostly it is pigeons! So I have slowed down a bit. Darn those critters, are they scaring all the birds away? 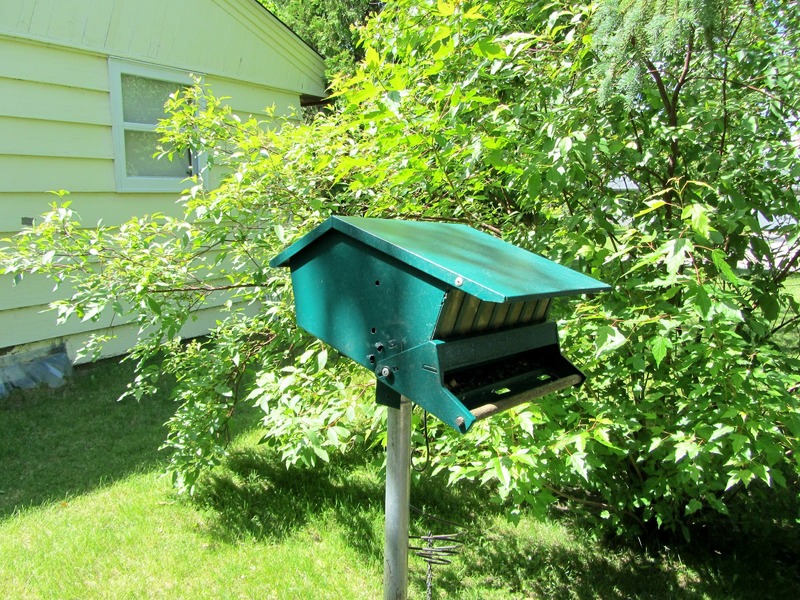 I have a couple feeders, but I just put seed in them this week. No birds yet. I did have a cute bird taking a bath in the bottom of my small waterfall the other day and I had so much fun watching him. I don't have large trees yet so I can't hang any feeders. Hopefully someday I will. Sorry that I am not much help. Hope you find a way to bring those birdies back. It's not in my budget anymore. I do fill my hummer feeder but I make the syrup myself so it doesn't cost much plus all my neighbors feed the birds so I don't need to.